Treatments Archive - A resource for people with a vision impairment due to macular degeneration, diabetic retinopathy, glaucoma and other eye conditions. The Vision Council released the low vision report Vision Loss in America: Aging and Low Vision to bring attention low vision patients and caregivers alike about low vision and aging eye disease. Among other facts and figures, the report highlights research showing that only approximately 20 percent of adults with severe vision impairment use devices that could help maintain activities of daily living. Click here to access our low vision report Vision Loss in America: Aging and Low Vision. This report was released in this month, as March is Save Your Vision Month, and has already been well received throughout the consumer press, including a nice piece about low vision from US News & World Report. This piece, entitled “Keep an Eye on Your Eyes” discusses four major eye issues (cataracts, glaucoma, AMD and diabetic retinopathy) and how to treat – and prevent – them. Protect your eyes from the sun by wearing sunglasses and eye protection as much as possible; adding a hat is even better. Be aware of any family history of eye problems – especially mom or dad – and if there is a family history, get screened regularly. Live as healthfully as you can; take care of your eyes by taking care of your overall health. 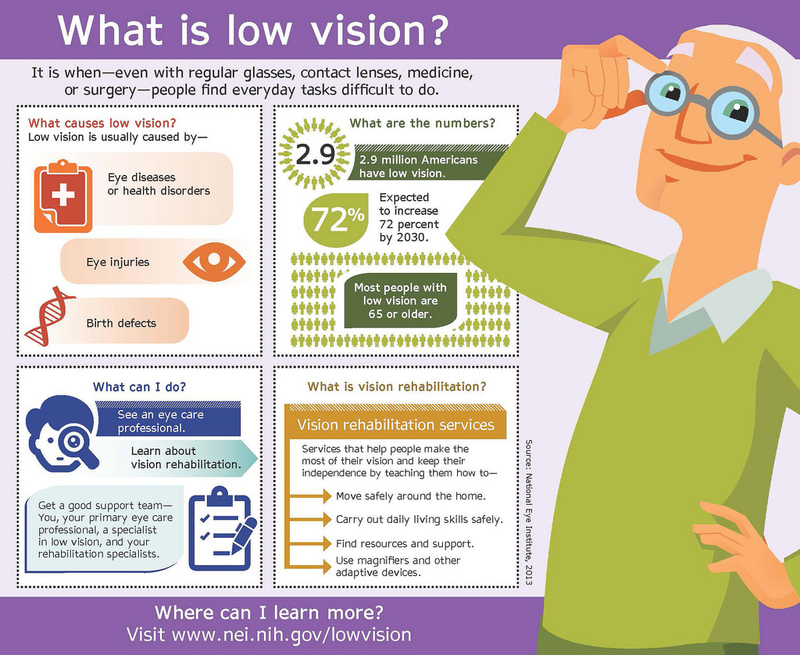 To celebrate Low Vision Awareness Month — the National Eye Institute created this infographic about low vision. As the second-leading cause of blindness in the world, glaucoma is a serious health condition that often goes undetected. An estimated 2.2 million Americans have the eye disease, but half of them don’t know it. In observance of Glaucoma Awareness Month, we encourage you to learn more about the disease, including warning signs. Most importantly, take this opportunity to schedule an eye exam and speak with the doctor about your personal risk factors. So what is glaucoma? Glaucoma is a group of eye diseases that damage the optic nerve, which transmits images to the brain. In most cases, increased pressure causes the damage, which can lead to permanent loss of vision if not treated. With open-angle glaucoma, the most common form of the disease, there are usually no symptoms prior to vision loss—and since the loss is slow and begins with peripheral or side vision, it can go unnoticed. Anyone can develop glaucoma, and at any age, but certain factors increase one’s risk. African Americans, for example, experience greater incidence, as do adults over 60. Family members of those already diagnosed, diabetics and people who are severely nearsighted also may develop glaucoma more easily. There is no cure for glaucoma, but further vision loss can be prevented with proper treatment. The key is early detection and treatment. High-risk patients should have a comprehensive dilated eye exam every year or two after age 35. Older adults should also get tested this frequently as well. Treatment for glaucoma varies depending on the type and its stage. Medications, surgery, laser treatments and/or eye drops can halt progression of the disease and help manage symptoms. • Follow your doctor’s orders. It is very important that glaucoma patients stick to a medication routine and schedule regular checkups with an eye doctor. Medications should be taken at the time of regular daily activities such as brushing one’s teeth or eating lunch so that the habit becomes routine. • Consider tinted lenses to help with glare and contrast. Yellow, amber and brown tinted lenses reduce the glare from fluorescent lights and can help make activities such as driving easier. On a bright day, try using sunglasses with a brown lens; on overcast days or at night, switch to yellow and amber tints. • Use devices that are geared toward people with low vision. Many electronic devices have options such as large display screens that make seeing and reading easier. Another option is to manually increase the font size. Watches, too, come with bigger faces and buttons that are easier to read and use. There are also a wide variety of low vision devices available through your low vision specialist to improve visual acuity while completing near, intermediate, and distance tasks. • Practice eye safety. Try to keep your eyes clean and free of irritants. Women should be careful about eye cosmetics, use nonallergenic brands and replace them often. It’s also important to wear protective glasses when working in the yard or playing contact sports. If you or someone you know has glaucoma, what other aids, devices and support do you recommend? It’s no secret that aging and changes in vision are related to one another. Although eye disorders and loss of vision can affect people throughout their lives, the prevalence of vision loss is likely to grow as you age. A recent report from Prevent Blindness America puts the economic burden of eye disorders and vision loss in the U.S. at $139 billion. That’s why access to low vision resources—such as low vision devices and vision rehabilitation services—is so important to individuals 60+ who are struggling to see and to maintain an independent lifestyle. A few facts first: The U.S. has an aging population. By the year 2020, there will be close to 90 million people in the U.S. 65 years of age or older. Of people 40+, 2.9M have some degree of vision impairment, not including blindness. Recognizing the symptoms of low vision early and taking the proper actions may help preserve sight and in some cases, can lessen the advance of low vision. Dr. Fischer highlighted four reasons specifically that are challenges for low vision sufferers. Access—Low vision progresses slowly. The ultimate goal for low vision patients and their doctors is to detect low vision early in order to maintain remaining sight and prevent further deterioration in vision. Scheduling a regular visit to an eye care provider is an important step in maintaining eye health. If you know someone who needs transportation to or from the eye exam, help him/her find a way to get there. Second, who’s going to pay/cover services? Medicare doesn’t cover all vision care; however, it does cover certain types of therapy including vision rehabilitation. Having access to an eye care provider or vision rehabilitation specialist will help restore and maintain the independence that is so important to older individuals today. Awareness— Eye care providers don’t always spend time on a low vision assessment. It is important for individuals to explain any vision changes to their eye care provider and to ask for a low vision assessment if their symptoms are representative of low vision. Look out for elderly family, friends and neighbors who might be experiencing some of the signs of low vision and help them know that low vision exams exist and can help them with their vision concerns. Acceptance–It is difficult for a person of any age to admit that his or her vision is deteriorating. Eye patients are often looking for a “cure” for their low vision—such as a stronger glasses prescription or a medical solution. Low vision patients need the appropriate counsel and the comfort of knowing that with vision rehabilitation and low vision devices, most people can remain independent for many years.